The South Florida Silver Palm Theatre Awards, founded ten years ago to honor theatrical excellence in South Florida, has announced that this year it will present the coveted award to 28 individuals and organizations. 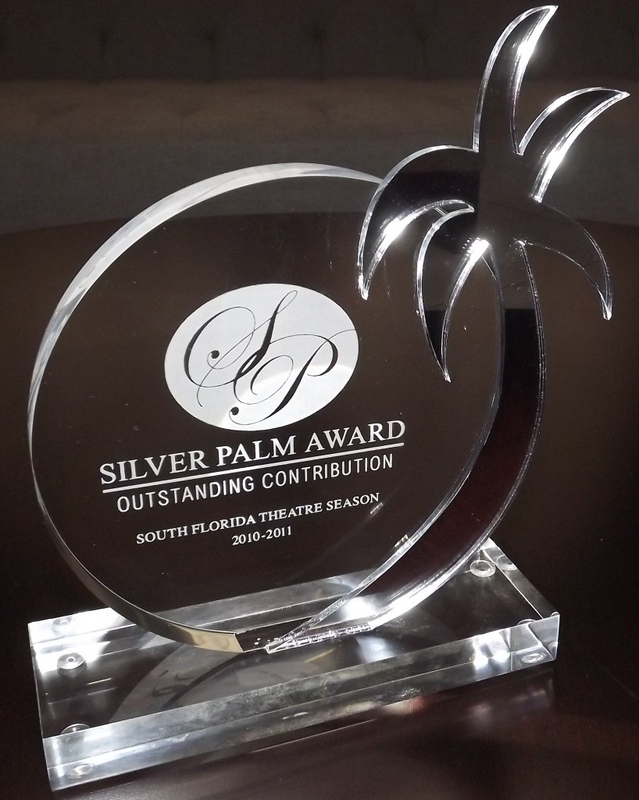 Silver Palm Awards have been presented to over 180 individuals and/or groups during the previous nine theatre seasons, and the “2016-2017 Season” consisted of shows that opened between September 1st, 2016 and August 31st, 2017. The awards are determined by a vote of the South Florida Theatre Press Corp, who Finstrom drafts each year into submitting nominations for outstanding contributions to South Florida Theatre. The votes are then tallied, from which a final list of recipients is determined. Finstrom (a playwright), BECON TV talk show host Iris Acker, and Florida Media News critic Ron Levitt are the co-founders of this award, and they served on this year’s Silver Palm Nominating Council along with Christine Dolen (artburstmiami.com, Miami Herald, Sun-Sentinel), Hap Erstein (Palm Beach Post, and Palm Beach ArtsPaper.com), Bill Hirschman (FloridaTheaterOnStage.com, and FloridaWeekly.com), John Thomason (Boca Raton Magazine, and FloridaTheatreOnStage.com), J.W. Arnold (South Florida Gay News), Roger Martin (MiamiArtzine.com, and BroadwayWorld.dom), Michelle F. Solomon (MiamiArtzine.com, and FloridaTheaterOnStage.com), John Lariviere (BroadwayWorld.com, and ArtsAmerica.org ), Jeffrey Bruce (TalkinBroadway.com), Aaron Krause (Birkshire Fine Arts, and TheateCritisim.com), and Mary Damiano (freelance theatre journalist/critic). This year the awards ceremony and reception will be helmed by the Silver Palm Award-winning theatrical producers Matt May and Jennifer Sierra-Grobbelaar. It will take place on Monday, December 11th, 2017, from 7:00 PM to 10:00 PM, at ArtServe, 1350 E. Sunrise Blvd., Fort Lauderdale. Playwright/actor and previous winner of multiple Silver Palm Awards Michael McKeever will host the awards presentation, assisted by last year’s “Outstanding New Talent” Silver Palm winner Emily E. Tarallo. Special thanks to ArtServe, George Wentzler Photography, Event Decor Direct, Elsie Grace Bakes, and Mimi’s Cake Pops by Janette Hernandez for their in-kind contributions to the evening’s festivities. Open to the public, there is a $15 advance reservation admission charge, or a $20 cash-only admission charge at the door. For further information and/or reservations, visit: http://www.silverpalmawards.com.